KANSAS CITY, Mo. -- Almost every time the Kansas City Chiefs readied themselves for a playoff game in the past 25 years, they had more reason to fear the rival quarterback than their opponents. Their fears, it turned out, were not unfounded. The Chiefs have lost 11 of their past 12 postseason games, dating back to January 1994, in large part because their opponents almost always had the superior quarterback, often one of the game's greats. The Chiefs lost eight games to quarterbacks who are either in the Pro Football Hall of Fame or have a reasonable chance (or better) to get there eventually. They countered sometimes with good players like Alex Smith, Trent Green and an end-of-his-career Joe Montana, but also with journeymen such as Steve Bono, Elvis Grbac and Matt Cassel. It's no wonder the Chiefs at times felt intimidated before kickoff. This quarterback deficit wasn't something the Chiefs talked about, but it hung over them like a dark cloud. "That conversation never occurred," said former offensive assistant coach Brad Childress, who was on the Chiefs' staff for their five most recent playoff games. "Maybe that was because it was just understood, but it never got verbalized. We just didn't go there. "Offensively, we were more worried about what we had to do against their defense to be able to be successful. In some cases we were, and in other cases we weren't." In Patrick Mahomes, the Chiefs finally have the kind of quarterback who can cause major problems for opposing defenses. And Mahomes will make his playoff debut Saturday (4:35 p.m. ET, NBC) against the Indianapolis Colts at Arrowhead Stadium. Mahomes, in his first season as a starter, had an answer for everything defenses threw at him. He's only the second player in NFL history to throw 50 touchdown passes and for more than 5,000 yards. "The way he's started his career, it's unlike any other in NFL history," said Green, who was 0-2 in the postseason as the Chiefs' starting quarterback, with both losses coming against Peyton Manning and the Colts. "When you have that kind of quarterback, you never think you're out of a game." Mahomes became the fourth quarterback selected by the Chiefs in the first round, and the first one in 34 years, when he was selected 10th overall in 2017. He is the first homegrown quarterback the Chiefs have ever committed to after spending most of their first 58 seasons with some other team's castoff at the game's most important position. Drafting Mahomes was more about the playoffs than the regular season. The Chiefs were fine with what his predecessor, Smith, accomplished in the regular season. He was 50-26 and helped the Chiefs to two AFC West championships in five seasons. But he was 1-4 in the playoffs. He did deliver the Chiefs' only postseason victory in their past 12 games, a 30-0 win over the Houston Texans in January 2016. The Chiefs had the superior quarterback in that game, for a change. Houston countered with a journeyman of its own, Brian Hoyer. Mahomes said he is unconcerned with Kansas City's playoff history, which includes losses in the Chiefs' past six games at Arrowhead. "I know the history and stuff like that, but at the same time, we're a different generation," Mahomes said. "I'm ready to go out there and win a football game at Arrowhead." His big debut season has the Chiefs thinking a new playoff era has arrived in Kansas City. "He's shown to be even more than we thought he would be during the draft process," team chairman Clark Hunt said. "We knew he had the ability to make [unconventional] plays, but what we didn't expect was that he would learn the offense as quickly as he has, learn how to read defenses, be able to operate coach [Andy] Reid's offense, which is very complicated. In so many ways he's exceeded our expectations. The Chiefs haven't always felt this way about the quarterback matchup in the postseason. 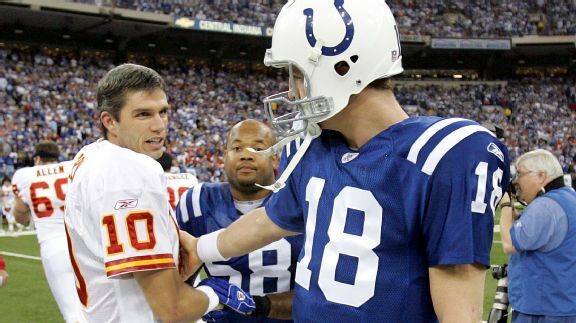 Green recalled rooting for lousy weather for the January 2004 game against the Colts at Arrowhead, hoping cold and perhaps freezing precipitation might slow Manning down. "We thought we were going to get weather in the 20s and windy," Green said. "We knew at the time, at that stage of his career, Peyton didn't have a high success rate playing outside in the cold. We were excited about that." Instead, the day was an unseasonably warm one in Kansas City, 51 degrees at kickoff. "I knew that day when I woke up it was going to have to be a shootout and we as an offense were going to have to hold up our end of the bargain because of the way it was," Green said. He was right. Manning threw for 304 yards and three touchdowns, and the Colts never had to punt. The Chiefs couldn't keep up and lost 38-31. "We'd always think we were in the right defense and then he'd make a check or an adjustment or he'd make a hand gesture that we thought meant a slant but it really meant a slant-and-go," former Chiefs linebacker Shawn Barber said of Manning. "The second we thought we had him, it became like the Trojan horse. He used what we thought we knew against us to hit us for six. So then we stopped paying attention to all of that and he burned us with that." "It was a frustrating day, a frustrating game." The Chiefs have been similarly frustrated in most of their past 12 playoff games, two against Manning and one each against Jim Kelly, Dan Marino, John Elway, Andrew Luck, Tom Brady and Ben Roethlisberger, among others. The Chiefs are finally going into a postseason contest with the expectation that their quarterback will be a problem like that for the other guys. "He means a lot," linebacker Justin Houston said of Mahomes. "His numbers speak for themselves. ... Any quarterback that can come into the game and put up that many touchdowns, it gives the defense some breathing room and puts us in a position to do what we like to do as defensive linemen and outside linebackers. We like to rush the passer. Any time you are ahead going into the fourth quarter, you can pin your ears back and go."